Customer is looking for traders. Just click. And go! ShareUrLoc - Promote your locations! 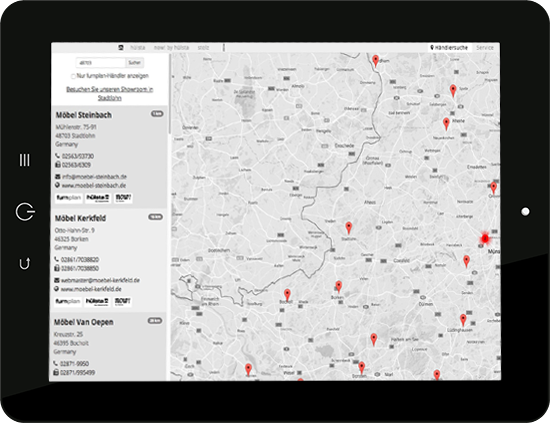 Easily providing customers with personal advice nearby – this is possible now with ShareUrLoc by web-kon. ShareUrLoc is the perfect addition to your website. When searching for the closest retailer, the user gets a list indicating all retailers in his surroundings, relevant contact information and optionally more customized data. Due to the clearly structured interface design, users in the frontend are provided with fast and relevant results. Administrators in the backend benefit from simple data management and configuration. This is your chance to offer this convenient opportunity to your customers so they find personal contacts nearby. Just click and go! ShareUrLoc is based on popular frameworks to ensure best performance on any device and an easy integration in your favorite System. 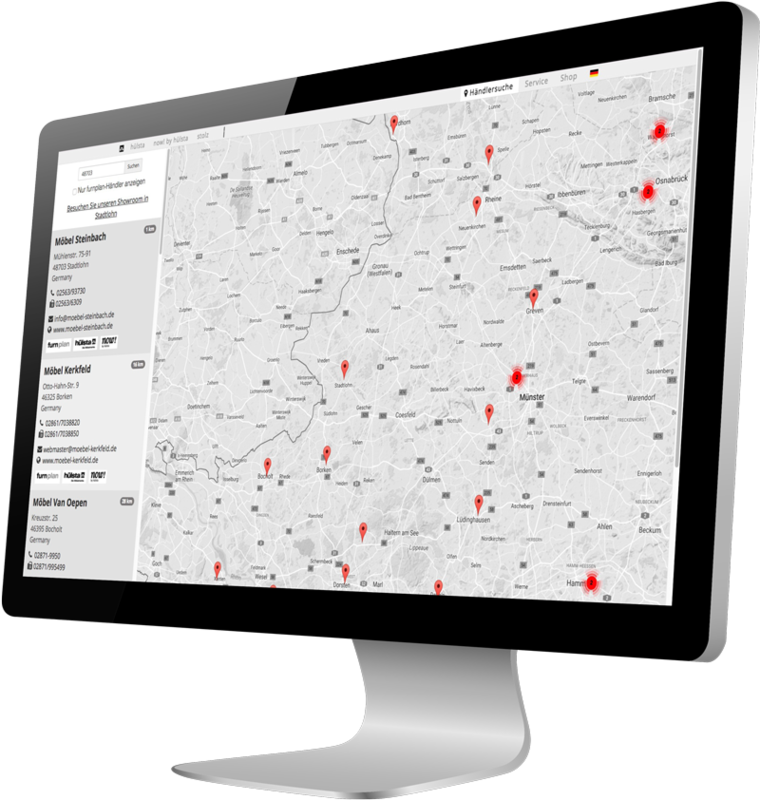 ShareUrLoc is a retailer search engine that offers your customers the possibility to find the location of the closest retailer either automatically or manually. When searching for a retailer manually, the customer has to enter his place or postcode. The list of results includes all relevant retailers, sorted by distance and visualized in a GoogleMap. The information displayed can be customized by each retailer. In the backend, you can use the automatical geo-coordination when you list the retailers with their adresses in order to obtain a clearly arranged customer list in the GoogleMap. You also have the option to add links that lead to internal or external pages and to make individual adjustments – according to your needs and depending on which information you want to provide your customers with. The text can be amended by each retailer individually. Also, you can assign pictures to the retailer and his showroom or contact person, etc. Retailers can be categorized and highlighted, depending on their personal needs. The highly customizable retailer search gives each user the option to shape ShareUrLoc according to their wishes. ShareUrLoc can be adapted to your corporate design in order to fit in visually into your website appearance. Besides the color design, the map view and pins can also be customized in color and graph. Read the documentation to launch your ShareUrLoc-Setup within minutes! You will find many examples and useful advices. Do you want more information about our pricing and your benefits? Get in Touch with your Clients. now! Related to online research, provide your customer with quick and clear information about the personal contact in his area so that your customer can be personally advised by the retailer. From web to business – easier with ShareUrLoc. Customer is looking for retailers. Just click! And go.